Prime Minister Manmohan Singh on Sunday said the country was passing through difficult times and the economic growth in the current fiscal would be 7 per cent, down from 8.5 per cent a year ago. For 68-year-old Kamla Persad Bissessar, the first woman Prime Minister of Trinidad and Tobago, India is not only a growing world economic power, a land of great opportunities, a great friend of her nation, but also her grand motherland. Hours after the Chief Election Commissioner S Y Quraishi voiced concerns over the role of moneypower in election-bound states of UP, Punjab and Goa, a sitting MLA from Charkhari constituency in Mahoba, Anil Kumar Ahirwal,was detained by the police after he was found carrying unaccounted cash in his car. With nearly three weeks left for polling, the ruling SAD-BJP government in Punjab appears to be claiming credit for some public initiatives it never took. SPORTS: Who after the BIG three? The Pakistan government, pushed on the backfoot by the army and the Supreme Court on Memogate, has hit back by making it mandatory for all civil servants, judges and military officials to declare their assets. Parliamentarians are already required to do so. The cabinet has approved an amendment to this effect in a draft bill. An Indian-origin couple that married in Punjab in 1925 and moved to Britain in 1965, has hit the headlines after celebrating their 86th marriage anniversary with the prospect of being the longest married couple in the UK. 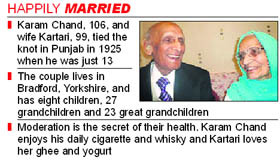 Karam Chand is 106 years old and his wife Kartari 99. The couple celebrated their 86th marriage anniversary yesterday.